Hepburn and Hepburn Springs are adjoining townships in the Victorian spa region, 5 km north of Daylesford and 90 km north-west of Melbourne. They were named after John Hepburn, a pastoral overlander who settled in the area in 1838. 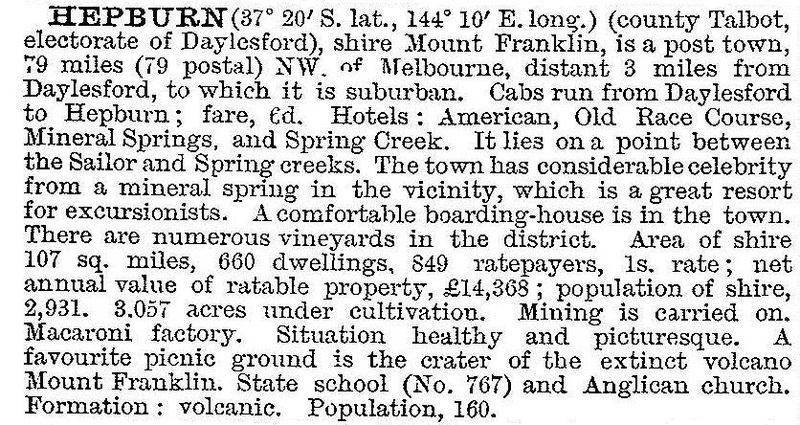 Hepburn Springs was originally known as Spring Creek, the site of a gold discovery in 1852 by James Egan (see 'Eganstown'). Gold was discovered at Daylesford in 1852, and alluvial mining extended northwards through Hepburn. The district attracted many Italian-speaking Swiss miners who were skilled at tunnel mining after the easier alluvial gold gave out. In addition to miners, the Italian-Swiss community included a doctor who was influential in the early mineral water industry, a merchant who constructed a hotel which later became a macaroni factory (1859) and a vigneron who built 'Parma House'. The Swiss Mountain mine operated until about 1900. Five years later the Hepburn Springs Pavilion was opened, to become an important attraction for holiday makers and honeymooners through to the 1920s. From one boarding or guest house in 1903 there were four in the 1920s: Dudley House next to the springs, Rolleri's Hotel and Parma House overlooking the springs, and Savoia House. A bottling works (1880s) was also near the springs. The Hepburn mineral waters contain effervescence from carbon dioxide, which is generated possibly from deep seated igneous compounds. The heyday of the Daylesford-Hepburn district as a holiday centre was from the Edwardian period to the early post-World War II years when private motor cars increased. Even so, there were 18 guest houses in the Hepburn area in 1952, the same number as in 1939. Hepburn Springs golf club opened in 1926. The decline after 1952 was rapid, however, and two guest houses remained in 1985. Since then, a revived interest in mineral waters has seen the refurbishment of the bath house (1985) and the opening of numerous bed and breakfast establishments. Hepburn and Hepburn Springs have a school (58 pupils, 2014), three churches, a shopping centre, a recreation reserve, a swimming pool, a golf course and numerous hotel/motel and resort venues. There are four springs in the springs reserve and others at Dry Diggings a few kilometres north. Golden Spring, 1 km to the north, is the start of a walk through the Hepburn Regional Park, passing through an area with old mining water races. Hepburn Regional Park extends from Sailors Falls in the south to Mount Franklin. 'Parma House' (1864) and the former macaroni factory (1859), both on the Main Road, are on the Victorian Heritage Register. The first annual Swiss-Italian Festival was held in May 1998. The Hepburn Community Wind Farm was begun in 2007 and by 2011 had won a Premier's Sustainability Award for its community involvement.